FOR MOST OF us who grew up in this country, with its reverence for Western medicine, it just sounds weird. Sticking needles in your skin all over your body? And expecting them to make you feel better? Seriously?? 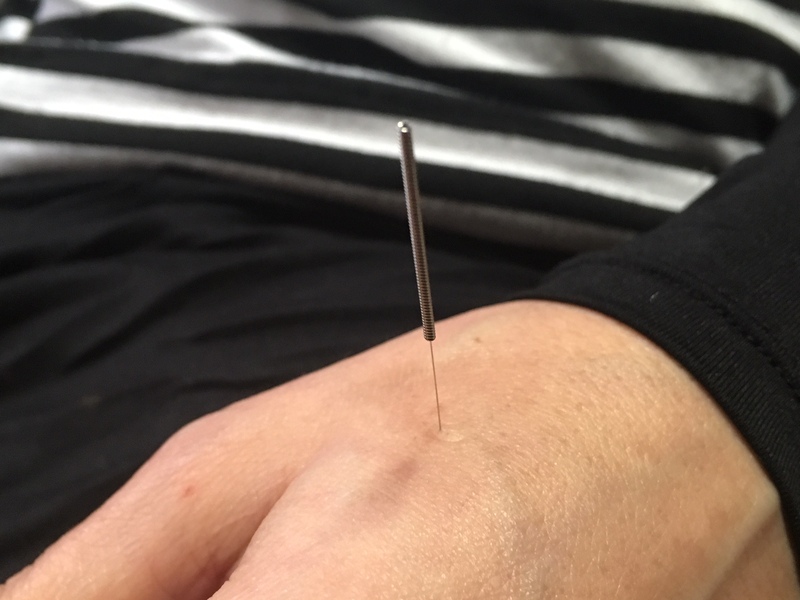 Yet acupuncture has been around for 3000 years, and increasingly western doctors are accepting it as a tool in fighting pain, migraines, stroke damage, respiratory and gynecological disorders, fatigue, addiction…and on and on. Roughly 15 million Americans have undergone acupuncture treatment in the last year–that’s almost five percent of the population. Your less-than-intrepid reporter has been one of those other 95%. Until now. His acupuncturist is Rachael DeLuca of Marquette. Doctor of Oriental Medicine. Four years of training at Southwest Acupuncture College in Santa Fe, New Mexico. He listens with trepidation and skepticism as she explains the idea behind acupuncture and why it works. 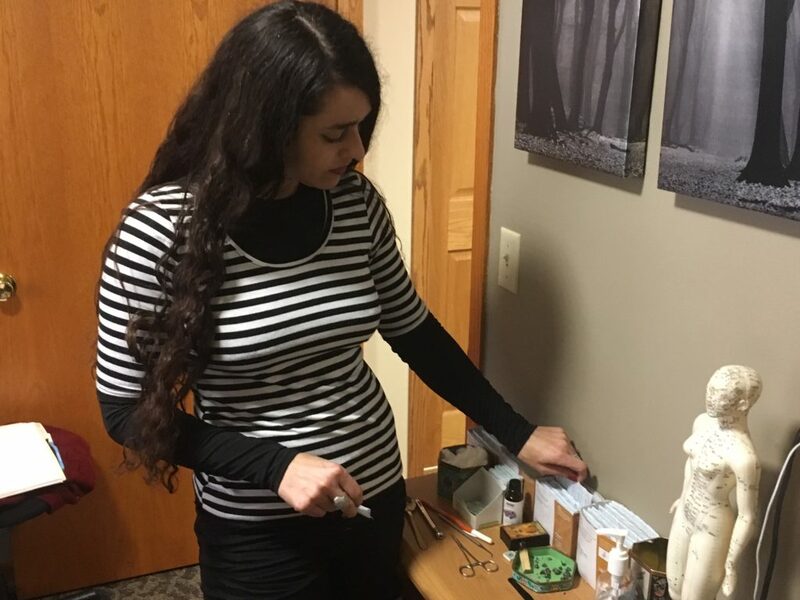 She says Chinese medicine is all about maintaining balance between the yin and the yang. The feminine and the masculine. Darkness and light. Restfulness and activity. He tries to comprehend when she describes the chi (chee)–the invisible, intangible energy that flows through your body. The life force. Okay. Makes sense. He’s got it so far. He’s still just a wee bit concerned about needles piercing his skin. She asks about his problems. He mentions lower back pain, occasional anxiety, insomnia, prostate problems. She checks his pulse (actually a few of them) along with other parts of his body. As for the back ache and kidney problems, those are different channels. She’ll work on those, too. “Let me show you the needles,” she says, pulling them out of a new package. Never been used, and they’ll be disposed of afterwards. “Kinda look like sewing needles,” he says. She’s right. They are much thinner. They’re stainless steel but they look like a thread, and they bend. She leaves the room, he mostly disrobes and gets under a blanket. Ahh, the bed is heated. Kinda like a massage. First, she does some cupping on him. Another form of therapy in which suction cups are applied to parts of the body where there’s blockage. It’s a slight sucking sensation, nothing more, for about two minutes. Feels good. “They only go in about a quarter of an inch,” DeLuca says, as she inserts the needles into his skin. He vaguely senses something’s happening on his back, shoulders, hands, legs, and feet, but only one of the insertions gives him a slight, momentary ache. The rest? Nothing. “How many do I have back there?” he mumbles through his face cradle. He can’t see it but he’s sure he looks like a freaking human pin cushion. “Do you feel anything?” she asks. “Mmmmgghh,” he responds through the face cradle. He turns his head slightly. “A…slight…electrical feeling,” he finally manages. He doesn’t. He listens to the faint, soothing music of Tibetan singing bowls over a sound system, and to the white noise coming from the air filter in the room and he…..almost dozes off. Doesn’t move a muscle for more than 20 minutes. She removes the needles. Nothing to it. After a few minutes, he manages to sit up. He gets dressed and meets her at the front desk. She tells him generally patients need three sessions with an acupuncturist to determine whether the therapy is helpful. He nods. He does feel good. Could it be the placebo effect? No way of knowing at this point, but yeah, the back pain has lessened a bit, and he feels an overall calm set in over his body. The chi and the blood flow are circulating better. Right? Two days later, he still feels that overall calm. Less fire going into the head, as DeLuca had described it. The Chinese couldn’t have been all wrong for the last 3000 years, could they? He decides to schedule a second appointment.